How Effective are Slogans for Bulding a Destination Brand in the Social Media Environment? The brand building impact of slogans for the destinations such as cities,states, and countries has received increasing research attention in the pastyears. This study specifically examines if and how the slogan for an unfamiliarcity impacts the image, attitudes, and behavioral intentions towardthe travel destination and its Facebook site. An online experiment of 95Facebook users produced the results contrary to the commonly held beliefsamong destination researchers and markers. The present research, conductedin a social media environment, shows a significantly less effect forthe most popular types of slogans in every measure including theirFacebook engagement behavior. Managerial and theoretical implicationsfrom the findings are discussed along with the limitations of the currentstudy and future research directions. The $1.2 trillion tourism industry (UN World Tourism Organization, 2012) has been considered one of the fastest growing industries in the world for some time (Caldwell & Freire, 2004). Each year, nations, states and cities spend considerable sums of money to promote their regions to poten-tial visitors and employ ad agencies or marketing firms to build a strong destination brand. Tourism has undergone tremendous growth as a result of technological and transportation advances and globalization's effect of a more closely connected and smaller world (Kavaratzis, 2005; Kerr, 2006). Indeed, the modern tourists have an unprecedented ability to travel to destinations pre-viously considered off-limits or too geographically isolated to travel to, such as Tierra Del Fuego. These historically inaccessible destinations now compete in the global marketplace for international visitors. Due to extreme competition and increasing similarities in the services and benefits offered by the competing destinations, a destination brand faces an urgent need to position itself distinctly from competing destinations. While many tourism destinations adopt the concept of brand-ing in an effort to differentiate themselves from their competitors, the in-dustry lacks proven and tested rules or generalized knowledge that can aid in developing a strong, successful destination brand. Marketers commonly use slogans as a positioning tool to set their brand apart from the competitors. Slogan is an array of words or phrases or state-ments that communicates either descriptive or persuasive information about the brand (Keller, 2007). What makes a slogan more effective than another is generally known in the corporate branding context. Despite the important branding potential of a slogan, there is little knowledge or guide on how to develop an effective slogan for a destination. Previous studies of destination slogans have either analyzed the content of existing destina-tion slogans or surveyed the opinions of travel agents or industry experts for what constitutes an effective destination slogan. The importance of the Internet for the travel and tourism industry has increased rapidly over the last few years. Currently, the vast majority of destinations make use of Facebook and other social media to connect with their potential visitors. However, there is void in the destination marketing literature with regard to the role of the new, social media in the destination branding process. The present research attempts to fill the void in the destination market-ing and communication literature. Particularly, the purpose of this research is three-fold: 1) to examine the effectiveness of slogans in building a desti-nation brand among potential tourists; 2) to determine if and how the effects vary by type or style of slogans; and 3) to explore if destination slogans can influence social media engagement behavior. A tourism destination is defined as a city, a state, a region, a country, or another well defined geographic area (Buhalis, 2000), such as Napa alley of California. The American Marketing Association (AMA, 2008) defines a brand as: a name, term, design, symbol, or any other feature that identifies one seller's goods or services as distinct from those of other sellers. A destination brand has been conceptualized in tourism marketing as a set of promises or propositions, which allows potential visitors to create expectations of the destination prior to their trip purchase (Berry, 2000). Shaping relevant preconceived expectations and perceptions among the potential tourists is of particular importance in the destination branding process, because of the challenges a traveler faces when evaluating a desti-nation without having experienced it prior to the actual trip. The 'priori' perceptions will help build a long-term image for the destination. Emphasizing the importance of image and perceptions in tourism, Pike (2007) argues perception is reality especially among the tourists who have no prior experience visiting a destination. The concept of destination im-age, generally defined as how tourists perceive destinations, has been cen-tral to tourism destination branding. The ultimate goal of destination branding is to create and enhance a long-term value or equity for a destination brand. Previous research has examined the role of brand image in building brand equity and found that brand image drives brand equity or value by affecting brand preferences, behavioral intentions, and the likelihood that consumers would recom-mend the brand to others (Cobb-Walgren, Beal, & Donthu, 1995; Del Ro, Vzquez & Iglesias, 2001; Biel, 1992). Ju-Pak and Lee (2009) have applied the concept of brand equity to the new media context and have defined brand equity for a website as consumer familiarity and image/perceptions about a website that lead to consumer loyalty to the site. They provide evi-dence that various features or functions in a corporate website may enhance brand equity and brand loyalty traits (i.e., intentions to visit and shop again) by affecting brand awareness/familiarity and brand perception/image. The brand building impact of slogans has received increasing research attention in the past decade. Kholi, Lance, and Suri (2007) proposed a mod-el of brand equity, which links slogans to antecedents to brand awareness, brand image, and brand knowledge. The corporate branding literature presents ample evidence that slogans help build brand equity by enhancing brand awareness or recall (Keller, 1993; McQuarrie & Mick, 1999), by pri-ming brand image/perceptions (Boush,1993; Pryor and Brodie, 1998), through the transfer of likeability (Brown and Stayman,1992), and though purchase intentions (Choi and Yoon, 2008). The literature on destination slogans is scant and lacks direct evidence for their effectiveness in branding. Because of the proven ability to differ-entiate a corporate brand and the value of building brand equity, some desti-nation researchers consider slogans an important part of tourism destina-tion branding and assume the positive effects of slogans in shaping pro-spective travellers' perceptions and purchase decisions (e.g., Park and Petrick, 2006; Park, 2004). Others note the limitations of slogans in desti-nation brand building and express their concerns with the inability of a slo-gan to capture all the appeals of diverse geographical and cultural regions as well as the essence of multi-attributed destinations (Klenosky & Gitelson, 1997; Richardson & Cohen, 1993) and the difficulty of matching slogans to brands (Dahlen & Rosengren, 2005). However, these conflict-ing assumptions have not been directly tested in an experimental setting. Richardson & Cohen (1993) conducted a content analysis of forty six state slogans in the US and classified them into eight categories. The pur-pose of their content analysis was to examine if and how often US states employ a unique selling proposition (USP) slogan, which the authors con-sidered most effective and desirable. For enhanced clarity, their eight content categories may be grouped into the following six exclusive classes based on the use and type of propositions. They include 1) no proposition with implicit affective qual-ities, which makes no claims but expresses some generic sense of excite-ment, for example, 'Yes! Michigan' or 'Utah! '; 2) no proposition, call-to-ac-tion only, which makes no specific claims but says 'come', such as 'Discover Idaho' and 'Visit California'; 3) common, affective proposition, which is equivalent to we are good, such as 'Maine, the way life should be', 4) com-mon, attribute-based proposition, 5) unique proposition with non-selling attributes, such as 'Delaware, the first state', and 6) unique proposition with selling attributes, such as 'Tennessee, we are playing your song'. The content analysis revealed that only 5 (10%) of the forty six state slogans employ a USP slogan. The majority of the US states (29, 63%) employed common propositions, with a half of which being attrib-ute-based and the other half affect-based. It is notable that nine (20%) state slogans made no specific proposition but expresses a general sense of ex-citement or makes a call-to-action only. Three (7%) state slogans made a proposition based on an attribute that is unique to the destination but is not selling. According to Pike (2007), a destination slogan may make propositions based on one or more of the following values: functional destination attrib-utes, affective qualities, travel motivation benefits, market segmentation, symbols of self expression, countering risks, brand leadership, focus, and unfocus. While useful for the development of a destination slogan, Pike's categories have rarely been implemented in the study of destination slogans. Employing Pike's value proposition categories, Ju-Pak & Lee (2012) conducted a content analysis of the slogans used by both Korean and American cities, states, and regions. The results indicate the vast majority of the one hundred and sixty two slogans used a combination of two or more value propositions. Consistent with the findings from the Richardson and Cohen (1993), the most frequently used categories were those employing 'functional destination attributes' and those emphasizing 'affective quality' of travel experience to their destination. Previous studies of destination slogans (e.g., Richardson & Cohen, 1993; Pike, 2004; Kholi., et. al., 2007; Klenosky & Gitelson, 1997) con-ducted content analyses or case analyses of well-known destination slo-gans to identify the underlying characteristics of effective destination slogans. Based on the anecdotal evidence, studies (Richardson & Cohen, 1993; Pike, 2004 & 2007) offer the guidelines for developing effective slo-gans for a destination. One of the common recommendations in the guidelines is to employ a USP slogan for destination brands primarily because of its ability to differ-entiate and previous success for corporate brands, (Richardson & Cohen, 1993; Pike, 2004). However, there is no empirical evidence that the USP slogans are more effective than other types for destination branding. One research reported in the destination branding literature provides evidence to the contrary to the commonly held belief. Klenosky and Gitelson, (1997) conducted a telephone survey of 260 travel agents in the US and found their choice of best state slogans to include 'I Love NY! ', 'Florida, When You Need It Bad, We Got it Good!' and 'Virginia is for Lovers', none of which made use of a USP. The national sample of American travel agents reported that their choices were on the basis of the slogan being easy to remember (17.1% of the mentions), conveying the image of the state (6.8%), appealing to the right market (5.4%) and being clever/amusing (4.9%). Kholi, et. al. (2007) conducted an extensive review of brand slogan studies and found little consensus among prior works on what constitutes a successful slogan. A careful examination of the extant literature indicates that the obvious inconsistency may be due to various factors moderating the effects of brand slogans. Previous research found the effect of brand slogans depends on the in-dividual's cognitive capacity or interest to process and product involvement. For example, McQuarrie and Mick (1999), in their study of specific rhetor-ical figures in American ads, found significant effects of slogans and logs on perceptions and attitudes. However, the effects significantly diminished or even disappeared for the recipients lacking the capacity required to ad-equately appreciate the contemporary American ads under review. Investigating the impact of ambiguous slogans subject to multiple inter-pretations, Dimofte and Yalch (2007) found that while the slogans worked as favorable preexposure priming cues about the brand, they did not influ-ence the attitudes of those who were more cognitively capable of accessing the multiple meaning of the slogan. On the other hand, those who were less capable due to lack of either relevant working memory or interest in thinking about the possible multiple meanings showed more favorable atti-tudes toward the ad with an ambiguous slogan. Other authors (Lagerwerf, 2002; Kholi, et. Al, 2007) indicate that slo-gan ambiguity, as a rhetorical device, could enhance the appreciation of ad slogans, only when it is resolved satisfactorily. When it is recognized as ambiguous but the literal and figurative meaning cannot be reconciled satisfactorily, the slogan ambiguity led to no or even negative effect. Choi and Yoon (2008) examined the effects of advertising slogans on brand awareness, ad and brand attitudes, and purchase intentions, and found no evidence of direct impact of slogans in any of the branding measures. However, they found a significant moderating role of product involvement in terms of brand recall and purchase intentions. Under high product involvement condition, the subjects exposed to the print ad with a slogan showed consistently higher scores than those shown the ad without a slogan. Interestingly, the opposite was true with low involvement conditions. The absence of slogans was associated with higher scores, re-gardless of the measures. According to Anholt City Brand Index (GMI, 2007), many countries and top cities have all of their tourism sites and online media directed at current and potential tourists. Search engines and social media have be-come important tools for marketing these destinations. Garin-Munoz & Perez-Amaral (2010) indicate that the traveler's online activities are important determinants for the perceptions and the loyaty to the destination as well as its site. Satisfaction online has a positive impact on loyalty both to the destination and its website. Understanding travellers' online behavior is of critical importance to travel suppliers and tourism authorities for formulating appropriate marketing strategies so as to fully exploit the potential of this medium. The media or context in which tourists obtain the destination in-formation play an important role in destination image and brand building (Pike, 2004 & 2007). The destination branding literature indicates that various information sources influence destination choice (Baloglu & McCleary, 1999; Beerli & Martn 2004) and tourists' perceptions and evalu-ations of destinations (Baloglu & McCleary, 1999). However, the effectiveness of each source will likely depend on the level of travel experience with the destination. Destination branding research (Leisen, 2001; Pike. 2004; Govers, Go, & Kumar, 2007; Klenosky & Gitelson, 1998; Tasci & Kozak, 2006) indicates the organic sources, such as word-of-mouth and word-of-mouse, are especially influential on first time tourists due to the difficulty associated with evaluating the tourism product before purchase. Awairitefe (2004) emphasizes the need to devel-op different types of messages for effectiveness, depending on the media or source used to deliver the message. To date, however, no research has been reported in the public literature that examined the impact of destina-tion slogans as a type of messages on social media engagement behaviors. R1: Does the impact of slogans on brand equity, if any, vary by slogan types? R2: Do destination slogans impact social media engagement behavior? R3: Does the impact, if any, vary by slogan types? To measure the impact of destination brand slogans in the social media environment, a Facebook-like page was developed on a private server. The Facebook page developed worked like a real travel destination site on Facebook, including typical features and components such as photo gal-lery, tour guide tab, city map, and the topical photos and sections where the visitors can read, click, and post their comments. The design and the content of the Facebook-like page were exactly the same across the ex-perimental conditions, except for the slogan used. The Facebook page content was selected carefully so that it would not be more relevant or fitting to a city's slogan than to another. The experimental stimuli for the present study are South Korean cities and their official slogans used in their tourism website. Content analyzing more than 80 Korean city slogans, three Korean-speaking advertising ex-perts selected two slogans that are most representative of each of the two position slogan categories. One of the four slogans was chosen to represent the no-position category by omitting its slogan and keeping the city name only. For each of the three conditions, the slogan chosen was prominently placed at the front page, as is typical among American destination tourism sites, as well as in other places throughout the site to ensure that the subject be exposed to the slogan. A sample of one hundred twelve college students in a Southern California university participated in a series of online lab experiments. The students were offered extra course credit for their participation. None of the sample subjects had prior visit experience with any Korean city. The subjects were given a brief instruction to the study and its procedure and then randomly assigned and linked to each of the slogan conditions, that is, a Facebook-like page for a city. They were asked to navigate the site as they would normally do on a Facebook page and were allowed a maximum of thirty minutes to navigate the page. They then link to a page to complete the online questionnaire designed to collect the data concern-ing the key variables of the study. At the completion of the online ques-tionnaire, they were debriefed about the purpose of the study. None of the subjects was aware of the true purpose of the research. This research examined three types of slogans drawn from the works by Jung (2009) and Richarson and Cohen (1993). They include unique/spe-cific value proposition, common/abstract value proposition, and no value proposition/city name only slogan. The branding measures for this research are the subject's recall of the site components, his/her perceptions/image, attitudes and behavioral in-tentions concerning the city and its tourism Facebook page. Specifically, the aided recall was measured by giving the subjects a list of seven compo-nents featured at the site and asking to check all that they remember seeing. To measure the image of the site, the study employed a 7-point Likert scale and asked the subjects to indicate how much they agree or disagree with each of the following statements: 'The content of the site is useful and informative', 'The site is fun to visit', 'The site is valuable', and 'The site is interesting'. The city image was measured by the level of agreement and disagreement with nine statements, including The city is lively and excit-ing, 'The city is safe and secure', 'People are sincere and friendly', 'The city is clean and attractive', and so on. Taken from the relevant literature (e.g., McKenzie & Lutz, 1983; Dahlen & Rosengren, 2005; Ju-Pak & Lee, 2012), attitudes toward the site or the city were measured based on the subject's rating on a seven-point scale concerning how 'satisfactory' 'favorable', 'good' and 'positive' the site or the city was. An index was produced by averaging the responses to the items (Cronbach's alpha = .95). The subject's visit intentions were meas-ured by the level of agreement or disagreement with the statements, 'I will visit the site again in the future' and 'I will consider visiting the city in the future'. The present research used four key engagement metrics (KEMs) to measure the social media engagement behavior, including the number of clicks, the number of likes, the duration of their visit (in seconds), and the number of comments posted. During the site visit, the subjects were al-lowed a maximum of two clicks, as they get into the photo gallery and tour guide sections. The subjects had a total of seventeen opportunities for likes and three areas where they could post comments and replies. The online questionnaire included additional questions concerning various demographic characteristics, Internet and social media use behav-iors, and prior knowledge and visit experience with a given city as well as the country, South Korea, which may impact the responses among the subjects. Of the 112 research participants, the responses from seventeen were not usable because they either have visited Korea or the particular city in question or have left the key questions unanswered. The final sample used for analysis included the responses from 95 adults. The sample was comprised of 53 females (55.8%) and 42 males (44.2%). The age ranges included younger than 20 years old (10.5%), 20 to 29 (83.2%), and 30 or older (6.3%). The respondents were most likely to spend 3 to 5 hours online (52.6%) and 1 to 3 hours (46.3%) being on Facebook on an average day. 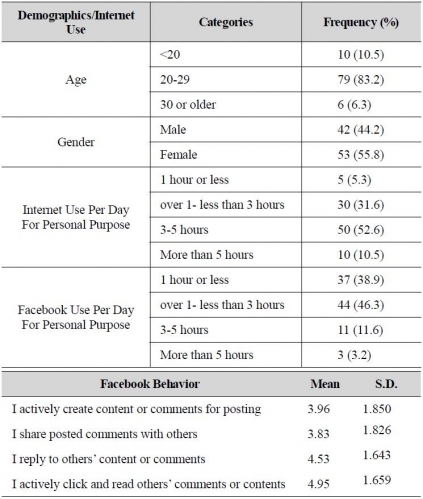 To measure the respondents' typical behavior on Facebook, the questionnaire asked the respondents to indicate, on a 7-point Likert scale, how well each of the four statements describes them on: 'I actively create content or comments for posting at Facebook', 'I share posted comments' or 'content with others', 'I reply to others' content or com-ments', and 'I actively click and read others' comments and content'. As shown in Table 1, the results indicate the sample respondents were more likely to 'read/click (4.93) or reply to (4.53) others' content or comments' than to 'actively create (3.96) or share (3.83) posts or content' on Facebook. According to the ANOVA, the daily Internet and Facebook con-sumption or the subject's Facebok behavior did not vary significantly by the classification variables used. The level of familiarity with the city they were assigned or with Korea in general was low and did not vary across experimental conditions. A significant difference existed only between male and female subjects in terms of their likelihood of sharing posted contents. Female respondents tended to agree more with the statement I share posted contents or comments with others. In addition, almost three quarters (72%) of the sample identified the city slogan they were exposed. There was no difference across slogan groups in correctly remembering the city slogan. Likewsie, no difference was found across the groups in the level of knowledge or visit experiences. About equal number of subjects (17-20) was originally assigned to each of the five slogans - two unique/specific proposition slogans, two com-mon/abstract proposition slogans and one no proposition slogan. Since the independent samples t-tests conducted for the two slogans of the same type (i.e., the unique/specific and the common/abstract propositions) showed no significant difference between the two, the data pulled for each type was used for further data analysis. To test Hypotheses 1 through 4, which assume a significant impact of the city slogan on recall, image, attitudes or visit intentions, ANOVA was conducted for each branding measure as the dependent variable and the three slogan groups as the independent variable. To check for the proba-bility of Type I error resulting from the unequal number of cases across the three groups, Levene's tests of homogeneity of between group variance was also conducted for each dependent variable showing p of <.05. Table 2 summarizes the ANOVA results. An average respondent recalled four out of the seven site components correctly. The ANOVA result for the aided recall shows no significant im-pact of slogans. Non- significant slogan impact was also found for the atti-tude toward the site or the city. However, ANOVA uncovers significant impact of slogans on the subjects' perceptions/image of both the site (F = 5.210, df = 2, p < .01) and the city (F = 5.051, df = 2, p < .01) as well as the intentions to visit both the site (F = 3.317, df = 2, p < .05) and the city (F = 5.791, df = 2, p < .01). The results provided overall support for H2 and H4 but failed to support H1 or H3. To see how the branding impact varies among the three slogan types (Research Question 1), pairwise mean comparisons were conducted for image and intention measures, employing Scheffe criterion or Tamhene's method depending on Lavene's test results. The results from the post-hoc mean comparisons demonstrate the most favorable responses for the no value proposition slogan, regardless of the measures. The differences between the two types of value proposition slo-gans did not reach statistical significance in any of the branding measures. A significant difference existed in every branding measure between unique, specific value proposition slogans and the no value proposition slogan. However, the Tamhene's method applied to the mean comparison showed that the common, abstract and no value proposition pair did not differ significantly in the intention to visit the city or the site. The other two research questions concerned the impact of destination slogans on social media engagement behaviors, which were measured by four key engagement metrics (KEMs). Table 4 displays the results from ANOVA tests. As indicated, the impact of destination slogans was only significant in the number of clicks made (F=3.194, df =2, p < .05) and in the number of likes (F=3.242, df =2, p < .05). No significant impact of slogans existed in the total number of posts or the amount of time spent viewing and interacting with the site. While the initial test of ANOVA showed a significant level of F, the subsequent Levene's test and the Tamhene's criterion applied led to a non-significant result for the number of likes. To see how social media engagement behaviors vary among the three slogan types (Research Question 3), pairwise mean comparisons ran post-hoc for the number of clicks, following the same procedure used for the branding measures. The mean comparisons revealed the same pattern for the number of clicks as that observed for the branding measures. The no value proposition slogan produced the number of clicks, which was sig-nificantly higher than that generated by either of the two value proposition groups. The two types, unique/specific and common/abstract value propo-sition slogans were not significantly different from each other. This study was motivated to contribute to the understanding of destina-tion branding by exploring the role of slogans in building a destination brand, especially its image and the other measures of consumer-based brand equity. The research is first of its kind to examine the impact of slo-gans in the social media context. The overall results of the study indicate slogans have significant impact on the image of a destination and its Facebook tourism site. They also influ-ence the potential tourist's intention to visit the destination as well as its Facebook site. Slogans, however, do not make a significant difference in building awareness or attitudes, concerning either the destination or its site. Findings also show that destination slogans can influence the potential tourists' social media engagement behavior, such as click and like. 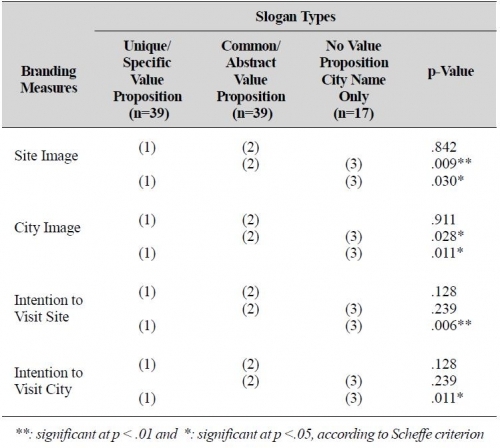 The current research found the branding effects of slogans vary by types. 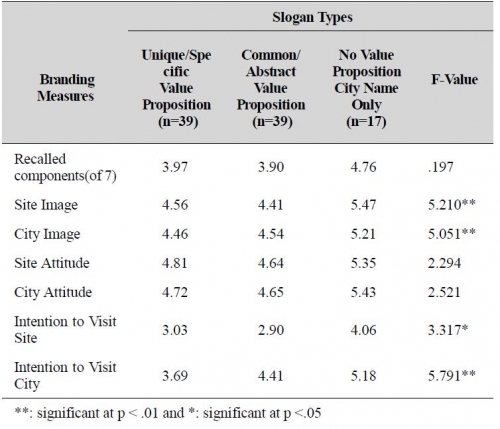 Regardless of measures, the no value proposition, destination name only slogan generated substantially more favorable responses than the slogans making a proposition based on either a unique, specific value (e.g., func-tional attribute of the destination) or a common, abstract value (e.g., affec-tive quality of the destination experience). According to the results, the intuitive account for the power of a unique selling proposition slogan in the destination branding literature (e.g., Richardson & Cohen, 1993; Pike, 2004; Kholi, et. al., 2007) may be erroneous particularly in the context of social media. The unique value proposition slogan for an unfamiliar city abroad was unable to demonstrate its branding power in the current study. 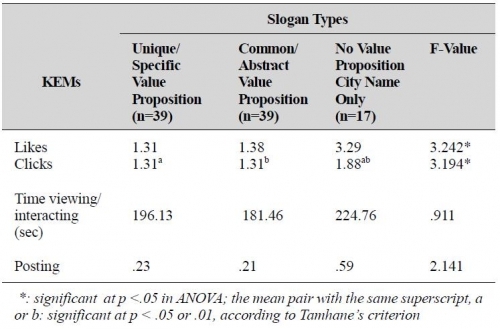 The lower favorability of responses to the unique, specific value slogan, compared to the no value proposition slogan, may have been due to the lack of 'selling' power (Richardson & Cohen, 1993) or meaningfulness (Kholi, et. Al., 2007) of the values offered by the former. The greatest image building power for the no value proposition slogan is unexpected but may be explained by the effects of slogan ambiguity found in previous research (McQuarrie & Mick, 1999; Dimofte & Yalch, 2007; Choi & Yoon, 2008). As McQuarrie & Mick (1999) found when the audience lacked access to additional clues in memory to successfully decode the meaning conveyed, the ambiguity present in the no value slogan with just an unfamiliar name of the destination, such as Chuncheon, may have created curiosity and led to more favorable responses. Dimofte and Yalch (2007) explain the effect of slogan ambiguity as follows. "Under the condition of incomplete or no cues about the stimulus, those who have low cognitive involvement or knowledge (with regard to the stimulus, added) may have considered the experience (of ambiguity, added) more interest-ing, much as a mystery novel entertains many readers (p. 51)". Another plausible explanation is that the value proposition or lack of it may have interacted with the content of the site. The slogans with a clear value proposition may have inhibited the appreciation of the destination and the information/content presented in its site, when the value proposed in the slogan, as a priming cue, did not match the site content followed. On the other hand, when no specific value proposition or priming cue was present, the unfamiliar destination name in the slogan, serving as an ambig-uous stimulus, may have created curiosity toward the destination and the Facebook site, and led to more favorable responses as the information or features of the site satisfied their curiosity (Lagerwerf, 2002). The assump-tions certainly warrant further testing. Several implications for the destination marketers can be drawn from the research findings. The fact that slogan effectiveness depends on the elements of branding measures suggests the branding goal of the destina-tion should guide in developing and implementing its slogan for effectiveness. In addition, the use of the right slogan may be critical for the successful achievement of branding effects for a destination brand. According to the results from this research, a slogan with no value proposi-tion and certain amount of ambiguity may be preferred for 1) unfamiliar destinations, 2) new, international tourists, 3) those who lack motivation or knowledge to make meaningful connections with the destination and 4) the brand's own social media channels where the brand lacks control over the content because the consumers or visitors are co-creators of it. This study has various limitations. The research results may have lim-ited external validity due to the use of a convenience sample of college students. The Facebook page used in the study was simple and basic in design and content, with a limited amount of engagement opportunities allowed, while it included various key features, functions, and contents identified in a content analysis of 20 American tourism sites on Facebook. This re-search has other limitations caused by the involuntary, incentive-driven nature of exposure to the test site and the measurement of the responses taken immediately after the exposure. The generalizability of the results will suffer to the extent by which the nature of exposure and the time of measurement affect the responses measured. Future research on the branding effects of destination slogans should be conducted with a diverse group of sample populations, destination brands, slogans, and online and offline media. The effects of destination slogans on social media behavior should be tested employing a larger sam-ple and a wide variety of engagement measures. Many theoretical assump-tions have been put forward to explain the unexpected findings from this study. Empirical research testing these assumptions is in order and will likely yield valuable insights into the role of slogans in building a destina-tion brand. In conclusion, more empirical research should be conducted to understand this increasingly important topic more clearly and thoroughly. 1.American Marketing Association (2008). Marketing Terms Dictionary. 2.Awaritefe, O. (2004). Destination image differences between prospective and actual tourists in Nigeria. Journal of Vacation Marketing, 10 (3), 264-281. 3.Baloglu, S. & McCleary, K. (1999). U.S. international pleasure travelers' images of four Mediterranean destinations: a comparison of visitors and nonvisitors. Journal of Travel Research, 38, 144-152. 4.Berry, L. (2000). Cultivating service brand equity. Journal of the Academy of Marketing Science, 28 (1), 128-137. 5.Biel, A. (1992). How brand image drives brand equity. Journal of Advertising Research, 32 (6), RC6- RC12. 6.Buhalis, D. (2000). Marketing the competitive destination of the future. Journal of Tourism Management, 21, 97-116. 7.Caldwell, N. & Freire, J. (2004). The differences between branding a country, a region and a city: applying the brand box model. Journal of Brand Management, 12 (1), 50-61. 8.Choi, M. and Yoon, I. (2008). Empirical research on the effect of the presence/ absence of ad slogans. Korean Journal of Advertising, 19 (6), 57-86. 9.Cobb-Walgren, C.J., Beal, C., & Donthu, N. (1995). Brand equity, brand preferences, and purchase intent. Journal of Advertising, 24 (3), 25-40. 10.Dahlen, M. & Rosengren, S. (2005). Competitive Interference Among Slogans for Weak and Strong Brands. Brand Management, 12 (3), 151-164. 11.Del Ro, A. B., Vzquez, R., & Iglesias, V. (2001). The effects of brand associations on consumer response. Journal of Consumer Marketing, 18 (5), 410-425. 12.Denton E. R. Jr. (1980). The Rhetorical Function of Slogans: Classifications and Characteristics. Communication Quarterly, 28 (2), 10-18. 13.Dimofte, C. and Yalch, R. (2007). Consumer Response to Polysemous Brand Slogans. Journal of Consumer Research, 33 (4), 515-522. 14.GMI (2007). How The World Views Its Cities. The Anholt City Brand Index, 2007. 15.Govers, R. & Go, F. (2003). Deconstructing destination image in the information age. Journal of Information Technology & Tourism, 6,13-29. 16.Jung, K. (2009). Linguistic analysis of district slogans. Korean Language and Literary Research, 33, 65-98. 17.Ju-Pak, K. & Lee, H. (2012), A Comparative Study of Korean and American Place Slogans. an unpublished work. 18.Ju-Pak, K. & Lee, H. (2012). Building a destination brand in the social media environment: the role and impact of destination slogans. A paper presented at the 8th Annual New Media Communication Conference, Macau, China, Dec. 6-8, 2012. 19.Ju-Pak, K. & Lee, K. (2009). A Normative Model of Web Equity for Online Retailers. The Korean Journal of Advertising, 20 (3), 77-96. 20.Kavaratzis, M. (2005). Place branding: a review of trends and conceptual models. The Marketing Review, 5, 329-342. 21.Keller, K. (1993). Conceptualizing, measuring, and managing customer based brand equity. Journal of Marketing, 57 (1), 1-22. 22.Keller, K. (2007). Strategic Brand Management: Building Measuring, and Managing brand equity. Upper Saddle River, NJ: Prentice Hall, 2007. 23.Kerr, G. (2006). From destination brand to location brand. Brand Management, 13 (4/5), 276-283. 24.Kholi, C., Lance, L., & Suri, R. (2007). Got slogan? Guidelines for creating effective slogans. Business Horizons, 50, 415-422. 25.Kholi, C., Thomas, S., & Suri, R. (2013). Are you in good hands? Slogan Recall: What really matters. Journal of Advertising Research, 53 (1), 31-42. 26.Klenosky, D. & Gitelson, R. (1997). Characteristics of effective tourism promotion slogans. Annals of Tourism Research, 24, 235-238. 27.Leisen, B. (2001). Image segmentation: the case of a tourism destination. Journal of Services Marketing, 15 (1), 49-66. 28.McKenzie, S. & Lutz, R. (1989). An empirical examination of the structural antecedents of attitude toward the an in an advertising pretesting context. Journal of Marketing, 53 (2), 48-65. 29.McQuarrie, E. & Mick, D. (1999). Visual Rhetoric in Advertising: Text Interpretive, Experimental, and Reader- Response Analyses. Journal of Consumer Research, 26 (1), 37-55. 30.Morgan, N., & Pritchard, A. (1999). Building destination brands. The cases of Wales and Australia. Journal of Brand Management,7 (2), 102-119. 31.Morgan, N. & Pritchard, A. (2005). Promoting niche destination brands: case studies of New Zealand and Wales. Journal of Promotion Management, 12 (1), 17-33. 32.Park, E. (2004). Making symbols and slogans for Korean destination brands. Korean Journal of Tourism Policies, 10 (2). 33.Park, S. & Petrick, J. (2006). Destinations' perspectives of branding. Annals of Tourism Research, 33 (1), 262-265. 34.Pike, S. (2004). Destination brand positioning slogans: Toward the development of a set accountability criteria. Acta Turistica, 16 (2),102-124. 35.Pike, S. (2007). Consumer-based brand equity for destinations: Practical DMO performance measures. Journal of Travel & Tourism Marketing, 22 (1), 51-61. 36.Pike, S. (2009). Destination brand positions of a competitive set of near-home destinations. Tourism Management, 30 (6), 857-866. 37.Richardson J. & Cohen J. (1993). State Slogan: The case of missing USP. Journal of Travel & Tourism Marketing, 2 (2/3), 91-109. 38.Tasci A. & Kozak, M. (2006). Destination brands vs. destination images: do we know what we mean?. Journal of Vacation Marketing, 12 (4), 299-317.